Do You Have Arthritis With Back And Knee Pain? Find Out If There Are Any Arthritis Cures! A recent study found that Participants With Arthritis Had Twice The Number Of Heart Attacks And Deaths From Heart Attacks, As Participants Without The Disease. These findings show that the onset of the disease brings on inflammatory changes that can lead to increased heart disease risk. Chronic Inflammation Is a Cause Of Arthritis. What Can You Do To Protect Yourself? We know that there is a connection between chronic inflammation and diet. Now many studies are showing that food allergies may be a cause of arthritis. This is something you could experiment with on your own. You simply keep a food diary, and note what you have been eating when you have a flare up. All processed foods such as crackers, cereals and junk foods. Try an anti inflammation diet for awhile and see if you get relief from your joint and chronic back pain. .
An anti inflammation diet is not too difficult to follow, and the benefits are tremendous. 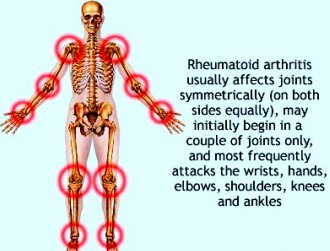 How Can You Get Joint Pain Relief, And Are There Any Arthritis Cures? Research now shows that tart cherries are effective for reducing inflammation, and also produce melatonin which could help you sleep. Sleep is very important for healing and joint pain relief. Doctors and other medical professionals are now discovering that a particular type of honey called Pure Manuka Honey has natural anti-inflammatory properties that are extremely effective in treating arthritis and other inflammatory diseases. Add more omega 3s to your diet. Seafood, and a pharmaceutical grade omega 3 fish oil supplement taken daily will help eliminate your Chronic Inflammation . Adding about two 3-ounce servings of seafood to your diet each week is a good way to increase your levels of omega 3s. The highest levels of omega 3s can be found in salmon, trout, mackerel, tuna, sardines and herring, which are all cold water, fatty fish. Most Importantly, Do Not Take For Granted That Your Joint Inflammation, Back Pain, And Knee Pain Are Just Part Of Growing Older . It could be a sign of lupus or another autoimmune disease. Here's what you should do for knee pain, and other joint pain relief. Get some exercise every day. If you have not been exercising because of knee pain, or back pain, consult a physical therapist and get on a program specifically for your situation. Something we should all do is practice deep breathing every day. Most of us are in the habit of shallow breathing from the upper lungs which increases levels of stress hormones and increases pain. While deep breathing we are helping every cell in our bodies to function properly. Sit comfortably in a chair, both feet flat on the floor. Close your mouth and inhale deeply through your nose. Feel your stomach and chest rise as you inhale. Hold your breath for as long as you comfortably can. Then exhale and blow out all the air you can, pulling in your stomach, and hold that as long as is comfortable. Repeat this deep breathing for at least 15 minutes a day. You can do this while watching tv or even driving. You can also incorporate it with your meditation. Deep breathing will lessen your pain for several hours afterwards. It helps you to relax and fall asleep at night too. Do You Think You Would Benefit From Deep Breathing? Click on meditation CDs on the left side and then scroll down. You should work with your doctor to safely lessen the pain and stiffness that might be troubling you, and to prevent more serious damage to your joints, your heart, and other organs. Take Charge of your own Joint Health. Do you have comments or questions to share? Maybe you have some tips that could help someone. The purpose of this group is to help and be helped. Feel free to add your own comments and start a discussion.